Critics of SoHo Proposal Ask, You Call This Improvement? Living in SoHo for decades has taught Sean Sweeney how to urge people to hurry up in several languages, though not without his blood pressure shooting up.“Rápido! Vite! Mach schnell!” he hisses as visiting crowds of shoppers shuffle along at a crawl. On weekends he sometimes barrels through packs of dawdlers like a bowling ball through pins. Once, when a group of people, coffees in hand, refused to move off his building’s stoop, the ensuing standoff nearly escalated into a fistfight. Now there are plans to bring in a business improvement district — a public-private partnership that collects assessments to pay for local improvements like better sanitation, marketing and beautification — and Mr. Sweeney and many of his neighbors are not pleased. SoHo, the Lower Manhattan neighborhood so named because it is south of Houston Street, has in the past four decades been transformed from a hard-bitten haven for artists into a magnet for such luxury retailers as Prada and Chanel. Partly as a result, the neighborhood’s residents are in the unusual position of fighting a plan designed to improve conditions in their area, even though the method has been widely embraced throughout the city and is overwhelmingly viewed as helpful, and benign. The controversy is in its second year and nearing a likely climax this March with a public hearing before the City Council. Not only has it tapped a primal fear among some in SoHo, it has also laid bare a neighborhood schism. The artists who colonized the neighborhood decades ago may have secured castles in the sky, but they also find themselves surrounded by streets that are clogged by tourists and lined with giant retailers and luxury stores. For them, having a business improvement district formed with the help of real estate giants means ceding more ground to invaders who, they believe, want to increase pedestrian flow to be able to charge more for retail space. “In SoHo, there’s always a concern that this neighborhood built by pioneers will be further eroded,” said State Senator Daniel L. Squadron, a Democrat who represents the area and opposes the plan. Brad Hoylman, the chairman of the local community board, which rejected the plan because of a lack of community support, was struck by the outcry. “I can recall few issues where there has been as much vociferous opposition as the SoHo BID,” he said, referring to the district by its acronym. But those who support the district say Mr. Sweeney, who himself leads a neighborhood activist group called the SoHo Alliance, and other opponents are fear-mongering and have got it all wrong. The district, they say, would be formed largely to deal with the effects of the masses that fuel SoHo’s runaway retail success. The Sanitation Department cannot keep up. Retailers have repeatedly been fined for messy sidewalks out front. Meanwhile, street vendors gobble up precious sidewalk space, choking pedestrian traffic. Supporters of the district say a full-time staff member could urge illegal vendors and food trucks to leave or could alert the police. Besides, proponents note, the proposed district itself would be only along Broadway between Houston and Canal Streets — and many dissenters live outside that zone. The first stirrings of a proposal for the district came three or four years ago. For nearly two decades, the nonprofit group ACE had supplied the area with street cleaners through a vocational program that provides transitional work experience for formerly homeless men and women. But in the past five years, the group, which was founded by the philanthropist Henry Buhl, received fewer and fewer donations from residents and retailers along Broadway between Houston and Canal. Sometimes the budget shortfalls exceeded $100,000, and the group found itself diverting money from other programs. “We were doing this for multinational corporations making billions, and this tiny nonprofit is shouldering this load for nothing,” said Jim Martin, ACE’s executive director. So last summer, ACE stopped cleaning the Broadway stretch, and the garbage began piling up. Mr. Buhl and some property owners had been floating the idea of creating the business improvement district by collecting regular assessments from property owners along Broadway to finance an agency that would have an executive director, organize regular street cleanings and tackle longtime thorny issues like illegal vending and food cart jams. After the community outcry at the organizers’ initial plan, they rejiggered some aspects, including decreasing the district’s proposed budget to $550,000 and ensuring that owners of residential co-ops and condos would pay only nominal assessment fees. Brian Steinwurtzel, who is on the district plan’s steering committee and whose family owns two buildings on the strip, said his group had been reaching out to residents along Broadway and had slowly but steadily won broad support. “This is about sweeping the sidewalks, cleaning the intersections and crosswalks, especially when it’s snowing, and it’s about taking the garbage and providing more garbage cans,” Mr. Steinwurtzel said. “The people who are part of ‘SoHo No BID,’ I would love it if they would help participate in this,” he added, referring to a group of the plan’s critics. Meanwhile, several residents on Broadway who initially opposed the plan said they found themselves supporting it. But many residents remain entrenched in their opposition. They worry that the district would give the upper hand to real estate titans with properties in the neighborhood and that it would eventually be expanded. They also argue that the proposed budget, now set at roughly $550,000, remains excessive, and that SoHo might find itself festooned with holiday lights and signs that would drive in yet more tourists. “BIDs & not-for-profits are carving up NYC and claiming those areas as their fiefdoms, bankrolled by taxpayer money,” Pete Davies, of the SoHo No BID committee, wrote in an e-mail. Another critic, Jamie Johnson, said the plan was an overly expensive solution to a terrible trash problem. “It’s ‘Let’s put in a chandelier when we only need a light bulb,’ ” she said. 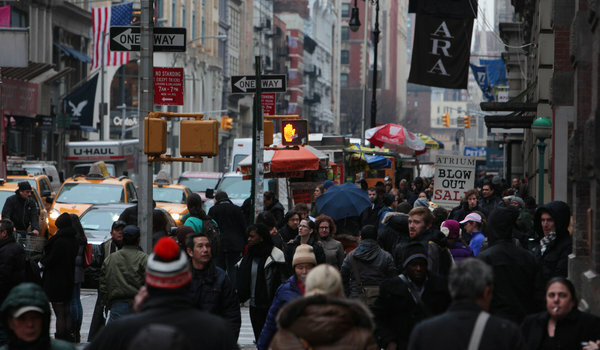 SoHo to NYU: Don’t Overwhelm Our Neighborhoods! Community to University: Don’t Overwhelm Our Neighborhoods! Written by AlanKrawitz on February 16, 2012. In so many ways, New York University has been a good neighbor and an integral, if not vital, part of the Downtown community. But, when it comes to the venerable school’s ambitious, super-sized building plans, dubbed NYU 2031, which would add four new buildings covering several million square feet within the Washington Square core, many longtime residents of the Village are beginning to see the school in a less-than-neighborly light. “We love the school, hate the plan,” said Brad Hoylman, chairman of Community Board 2, who attended Saturday’s rally at Judson Church, where hundreds turned out to protest NYU’s massive building plans. Holding signs with slogans that read, “Flowers, not towers,” and “Condemned by NYU: Gardens going, going, gone,” a crowd of nearly 500 that included village residents, community activists and politicians expressed their disapproval of the scale and scope of NYU’s 20-year building plan that would effectively remake the face of Greenwich Village and the surrounding area. 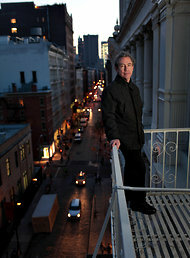 Hayes added that many villagers see the NYU plan as self-serving, as opposed to the neighborhoods’ aspirations to preserve the character of the area. She also pointed out that the school had received—and declined—numerous offers to expand in Lower Manhattan below Canal Street. The NYU 2031 Plan is only a month into the lengthy, 7-month Uniform Land Use Review Procedure that involves approvals and recommendations from the Community Board, the borough president, Department of City Planning, City Council and the mayor. While many in the community are already calling for the NYU plan to be scaled back, Hoylman says that the plan is too concentrated in a very small, dense area and will ultimately bring thousands of new residents, students and faculty members to an already overpopulated and vulnerable neighborhood that includes seniors and rent-stabilized residents. “At the moment, there is really no flexibility on NYU’s part,” he said. Older residents have talked to me that the NYU 2031 plan resonates with Occupy Wall Street. Here we do not have a large financial institution but a financially well-endowed institution where elite interests and political dealings have likely trumped the people’s voice,” Jeanne Wilcke, president of the Downtown Independent Democrats. Sean Sweeney, a member of CB2 and the SoHo Alliance, sees the NYU plan as having even more far-reaching effects. “Although many say that this NYU plan will affect the Village only, in fact it will severely impact Soho, Noho and Tribeca much more than most of the Village, since the plans for construction are focused on Houston Street and the two blocks north of that [Bleecker and West 3rd streets],” Sweeney said. Read Story Here: Critics of SoHo Proposal Ask, You Call This Improvement? MYFOXNY.COM – A public hearing on Monday about NYU’s expansion plans quickly turned into a shouting match when people outside couldn’t get in. The meeting was eventually stopped and moved to a nearby church to accommodate the large crowd, which was largely against NYU’s 2031 Core Initiative: A 20-year, 2.4-million-square-foot expansion plan to include four new buildings and an overhaul of the area’s zoning laws. It has drawn fire from many local community groups and many NYU neighbors. One of the groups fighting NYU’s plans is the Greenwich Village Society for Historic Preservation. Andrew Berman, the executive director, said that NYU’s plan to shoehorn new buildings into existing space would clog up an already densely populated area. But NYU Vice President Alicia Hurley said the plan would be an economic benefit to the area, bringing money and jobs.